Ladies and Gentleman! Boys and Girls! Children who like to smile! Everyone who likes to laugh and have fun! Meet the Capital Region's and Tech Valley's Electric City Clowns staging from Schenectady, New York! Hey! Look At The Clowns! 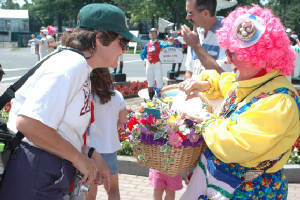 2011-2012 President of the Electric City Clowns, Marie "Mischief" Beck, clowning around and getting lots of laughs! We meet at 7 PM, the fourth Wednesday of the month, with some exceptions. Next meeting is...ya got to look inside! Share your smiles with us!